Let's talk skin today! 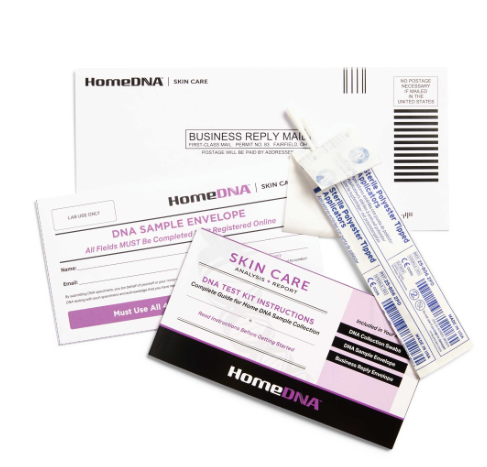 A few weeks ago I shared on my Insta-stories I was working with Home DNA to get an analysis and report on my skin. I was so excited to try this because I'm always looking for ways to maintain and improve my skin. If someone can give me a report on what my skin will more likely be prone to as I get older and I can improve that now, please sign me up! So here's how it works! In the kit, I was sent two swabs for a simple at home cheek swab. (so CSI) I enclosed it in an envelope and mailed it back in a pre-paid envelope that was provided. It's then sent over to the DNA Diagnostic Center's lab where it's analyzed for your skin's generic markers in relation to skin aging and health. In about three weeks it's all sent back to you in a report you can view online that covers areas like your proneness to fine lines and wrinkles, skin elasticity, collagen quality, sun protection, pigmentation, skin sensitivity and skin antioxidants. This is so amazing because this is a guide to help you improve and maintain great skin. My results are in and I wanted to share them with you guys. I was a little nervous about getting them but I now see where my skin needs improvement on. The report is so detailed and the part your skin needs improvement in, it recommends what topical/ supplement ingredients, and professional treatment you need for your skin. On all these categories my skin is optimal! I don't have any genetic variations and the genes are functioning at an optimal level. I was really worried about the fine lines and wrinkles category because they are my nightmare. I'm an avid user of anti-wrinkle creams and I always been like that from an earlier age. These two categories my genes processes are functioning at standard level. This is a pretty common result and is standard in many people. My results indicated I carry some of the genetic variations that can speed up the rate where my collagen decreases. The skin collagen level normally decreases with age by mine are prone to decrease twice as fast. Collagen is very important because is the major protein found in the skin. I'll definitely be more conscious when shopping for my skin care products and buy products to improve the quality of my collagen. Here are some of the suggested things I can do to improve. This analysis was amazing! I'm a skin care junkie and I'm always worried about any harm to my skin. I'm constantly trying new products to see what works for me. I will continue to maintain the health on my skin and improve in the areas I now know I need improvement. If you want to try this kit out you can check out your local CVS to see if they carry out. If you do try it please let me know would love to know your results! This product was provided as a sample and as always all opinion are my own. Thank you for supporting the brands that work with Patty's Kloset. Utilizing characteristic healthy skin items is a decent initial phase in giving the skin the correct supplements and building materials to hold its wellbeing and usefulness.